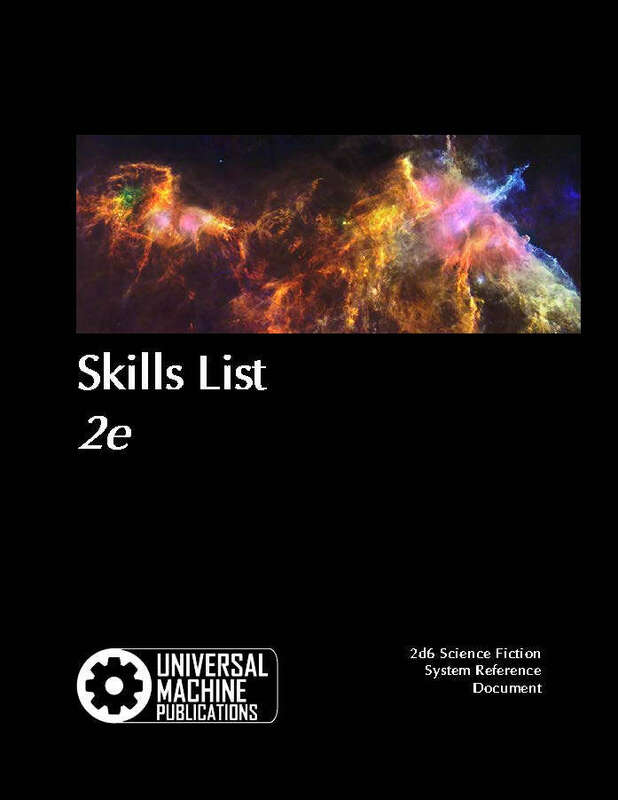 The Skills List for the second edition update of the 2d6 science fiction system reference document (2e 2d6 SF SRD) is the foundation of the Universal Machine core mechanic. This simple, two column, two page document comes in Word, Open and Rich Text file formats. A bonus formatted PDF gives you the skills list in the classic science fiction roleplaying game font and layout, giving a true Old School roleplaying look. Universal Machine products integrate with other 2d6-based science fiction RPG systems, including the original 2d6 science fiction RPG modules and supplements. Universal Machine products can also be used seamlessly with Cepheus Engine materials. All Universal Machine content is Open Gam eContent (OGC) under the Open Game License v. 10a (OGL) except the OGL itself, which is © 2000 Wizards of the Coast, Inc. A copy of the full OGL v 1.0a can be found at the end of each file. The 2d6 Science Fiction System Reference Document (‘2d6 SF SRD’, '1e 2d6 SF SRD', '2e SF SRD'), is © 2014-2017, Universal Machine Publications.